GAO-11-71: Published: Jul 28, 2011. Publicly Released: Aug 25, 2011. 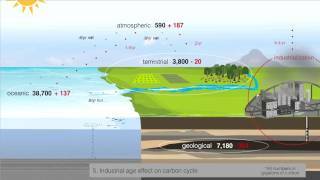 In six steps, this animation depicts the changes that have occurred over time to the global carbon cycle, including the amount of carbon existing in and moving between the planet's major carbon reservoirs before and after 1800. 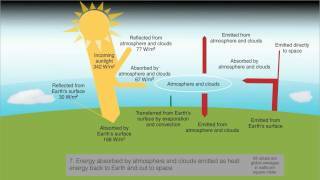 In eight steps, this animation depicts the path of sunlight that enters the planet's atmosphere, illustrating how that radiation is reflected, absorbed, and emitted as heat energy. Reports of rising global temperatures have raised questions about responses to climate change, including efforts to (1) reduce carbon dioxide (CO2) emissions, (2) adapt to climate change, and (3) design and develop climate engineering technologies for deliberate, large-scale intervention in Earth's climate. Reporting earlier that the nation lacks a coordinated climate-change strategy that includes climate engineering, GAO now assesses climate engineering technologies, focusing on their technical status, future directions for research on them, and potential responses. To perform this technology assessment, GAO reviewed the peer-reviewed scientific literature and government reports, consulted experts with a wide variety of backgrounds and viewpoints, and surveyed 1,006 adults across the United States. Experts convened with the assistance of the National Academy of Sciences advised GAO, and several reviewed a draft of this report. GAO incorporated their technical and other comments in the final report as appropriate. Climate engineering technologies do not now offer a viable response to global climate change. Experts advocating research to develop and evaluate the technologies believe that research on these technologies is urgently needed or would provide an insurance policy against worst case climate scenarios--but caution that the misuse of research could bring new risks. Government reports and the literature suggest that research progress will require not only technology studies but also efforts to improve climate models and data. The technologies being proposed have been categorized as carbon dioxide removal (CDR) and solar radiation management (SRM). CDR would reduce the atmospheric concentration of CO2, allowing more heat to escape and thus cooling the Earth. For example, proposed CDR technologies include enhancing the uptake of CO2 in oceans and forests and capturing CO2 from air chemically for storage underground. SRM technologies would place reflective material in space or in Earth's atmosphere to scatter or reflect sunlight (for example, by injecting sulfate aerosols into the stratosphere to scatter incoming solar radiation or brightening clouds) or would increase the planet's reflectivity (for example, by painting roofs and pavements in light colors). GAO found these technologies currently immature, many with potentially negative consequences. Some studies say, for example, that stratospheric aerosols might greatly reduce summer precipitation in places such as India and northern China. Many experts advocated research because of its potential benefits but also recognized its risks. For example, a country might unilaterally deploy a technology with a transboundary effect. Research advocates emphasized the need for risk management, envisioning a federal research effort that would (1) focus internationally on transparency and cooperation, given transboundary effects; (2) enable the public and national leaders to consider issues before they become crises; and (3) anticipate opportunities and risks. A small number of those we consulted opposed research; they anticipated major technology risks or limited future climate change. Based on GAO's survey, a majority of U.S. adults are not familiar with climate engineering. When given information on the technologies, they tend to be open to research but concerned about safety.